Rotomoulding Powder Market size is estimated to surpass USD 29 billion by 2024; according to a new research report by Global Market Insights, Inc. 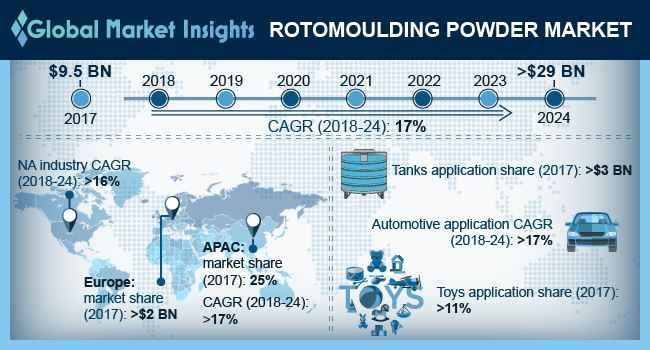 Positive application outlook across automobile industry owing to the key properties including flame retardant and UV resistant will propel the rotomoulding powder market size. Factors such as ease of manufacturing and less polluting by product during manufacturing will support the product adoption rate. Rotomoulding powder is a widely used process for the manufacturing of various packaging & plastic products. Surging demand in the packaging industry for various industrial products will proliferate the rotomoulding powder market expansion. Easy availability of raw materials, and long term supplier contracts from the domestic material manufacturers will further enhance the business size in the developing countries such as India, China, and Indonesia. Key rotomoulding powder benefits includes flexibility, seamless construction, double wall products, foamed products, low cost, and easy to vary thickness. Upsurge in the industrial sector supported by various government policies will propel the product penetration in the rotomoulding powder market. For instance, in India, growing government emphasis on development in agriculture, health and sanitation, and infrastructure will foster tremendous potential & opportunities for the rotomoulding powder market revenue. Linear low-density polyethylene market is projected to witness CAGR over 17% by volume in the forecast period 2018 to 2024. Several applications including automotive components, insulated containers, and tanks will drive the product portfolio growth. Key properties such as high strength at low temperatures, corrosion resistant, and crack resistance will be an impetus for the rotomoulding powder market expansion. Tanks application is projected to surpass 6000 kilo tons in the forecast period 2018 to 2024. Surging demand for the septic & water storage tanks notably in India, China, and South Africa owing to the rapid developments in residential & commercial sectors will proliferate the rotomoulding powder market growth. Key features of rotomoulding powder including easy availability and improved properties will enhance the demand in the tanks production process. Leisure applications is anticipated to witness a CAGR over 18% by revenue in the forecast period 2018 to 2024. Rapid expansion in tourism and recreational industry owing to the shifting trends towards traveling and changing work days dynamics across the world will propel the rotomoulding powder market size. For instance, in July 2018, a New Zealand e-will managing company, Perpetual Guardian confirmed application of four-day work week after successful trial for 3 months. As per the trial results, staff stress levels lowered by 7%, work-life balance improved significantly by 24%, and leadership & commitment levels improved by 18% and 20% respectively. Asia Pacific rotomoulding powder market will witness CAGR over 17% by revenue in the forecast period 2018 to 2024. Surging residential & commercial infrastructure owing to the growing population coupled with rising income levels will escalate the product demand in various applications. For instance, as per the PwC report on Emerging Trends in Real Estate in 2018, senior housing accounts for 16%, student housing accounts for 14% and business parks accounts for 14% market share. Europe rotomoulding powder market accounted over USD 2 billion in 2017. Rapid growth of the electric vehicles segment in the automotive industry owing to the increasing environment conservation concerns will propel the rotomoulding powder business growth. For instance, as per the article in Euractiv in May 2018, average emission for new cars will fall 30% under the European Commission’s first light vehicle proposal. Key incentives will be offered to the manufacturers to produce more zero-emission electric vehicles. Key rotomoulding powder market players include Green Age Industries, Broadway Colours, Du Pont, Pacific Poly Plast, Matrix Polymers, A. Schulman, Inc. and Phychem Technologies Pvt. Ltd., Reliance Industries Limited. Other prominent market players are D&M Plastics, Kiel Industries, BASF, The Dow Chemical Company, SABIC, Exxon Mobil, and Lyondell Basell. Business strategies including mergers and acquisitions coupled with various joint venture opportunities will further strengthen the global presence with strong foothold. For instance, German company BASF SE will complete its USD 1.88 billion acquisition of Solvay SA’s nylon business in 2018.